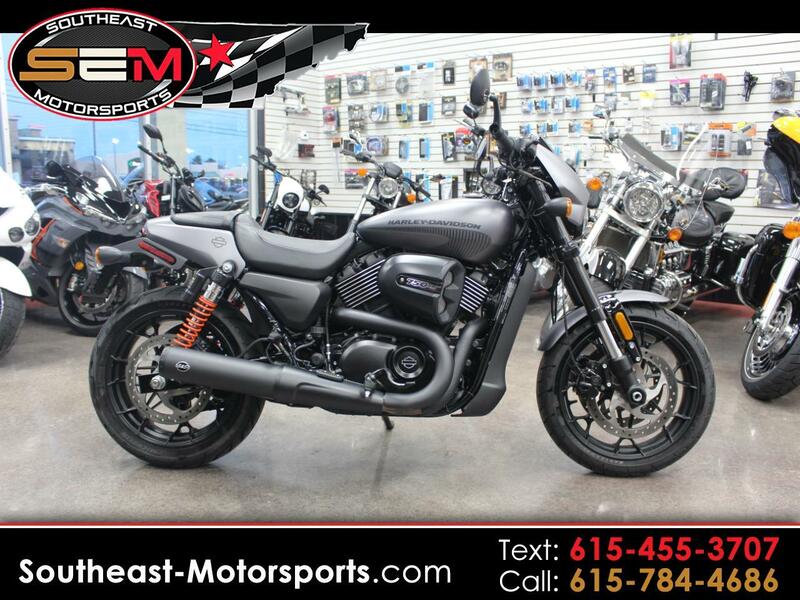 Just in is this 2017 Harley Davidson 750 STREET XG750A . This bike is in like new condition and loaded with only 886 miles. This bike comes with S&S exhaust.Come check it out today this deal wont last long.This bike has also been through our certified mechanics 128 point inspection so buy with confidence. We also offer extended warranties on our vehicles. Here at Southeast Motorsports we also offer aggressive financing for any type of credit situation with rates as low as 2.3% and terms as long as 84 months. Please contact us with any questions and visit our website www.southeast-motorsports.com to get preapproved and to check out our other great cars, trucks, suv's, and motorsports products. Visit Southeast Motorsports online at www.southeast-motorsports.com to see more pictures of this vehicle or call us at 615-784-4686 today to schedule your test drive. Used unit prices, discounts, savings and other special offers may include some or all manufacturer incentives, which are assigned to the dealer. Some manufacturer incentives may not be available to all buyers or may require financing with a specific lender. Financing, leasing and down payment offers are available to buyers with Top Tier credit, not all buyers will qualify, may be in lieu of other manufacturer incentives and are subject to change by the lender. APR means annual percentage rate. Service and parts prices, discounts, savings and other special offers are plus tax and shop supplies where applicable. All prices, discounts, savings and other special offers are subject to change. Used illustrations and videos are for design purposes, actual vehicles may have different equipment or look different. Vehicle equipment listed may be incomplete. Differences in MSRP for what appear to be similarly equipped vehicles may be due to additional manufacturer installed equipment or limited time manufacturer "value packages" not listed. MSRP does not include dealer installed equipment, if applicable. MPG is based on EPA mileage estimates. New vehicle MPG is based on the EPA mileage estimates for the model year of that vehicle, reflecting new EPA fuel economy methods beginning with 2008 models. Use for comparison purposes only. Do not compare to models before 2008. Your actual mileage will vary depending on how you drive and maintain your vehicle. Not responsible for typographical errors. Some information and pricing may be unintentionally missing or inaccurate. We will make every attempt to correct such discrepancies promptly upon notification of such errors or omissions however pricing discrepancies and other errors are considered invalid and may or may not be honored at our sole discretion. Payment calculator is a tool for estimating, not for determining exact finance amounts. Actual odometer reading may vary due to test drives and other miles driven since vehicle was listed. Vehicles are subject to prior sale. Inventory listed is updated frequently however some vehicles may no longer be available for sale. All sales are subject to $149 doc fee not included in advertised price. Message: Thought you might be interested in this 2017 Harley-Davidson Street 750.